Edward Hays' books are like candy, at least for me. 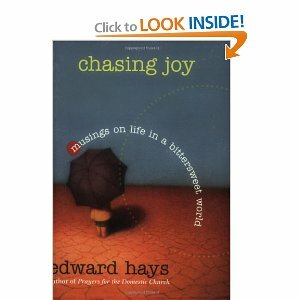 Even more than his daily healing therapies in Lenten Pharmacy, Chasing Joy is an excellent devotional companion for any season of the Church year. I have come to really savor the way Hays can recast a wide range of anecdotes, biblical references, and folk stories with whatever subject is at hand. In the case of this book, it's about pursuing happiness, that historic American virtue. For Hays, joy just doesn't happen. Rather, it's a choice, and even more, it's a practice. Like that of prayer and gratitude, we access joy not by nature or instinct, but by intention. And myriad disciplines are offered, a sort of "yellow brick road" to enduring joy, most of which stem from what Hays calls the "holy trinity" of I Thessalonians 5:16: "Always be joyful and never stop praying. Whatever happens, keep thanking God because of Jesus Christ. this is what God wants you to do." CEV Some of the more creative practices are the three-fold chuckle, and a habit hand-picked just for us culture-of-stuff Americans. This is the practice of attributed to Socrates, who was known to have wandered through the Greek marketplaces and exclaimed with a laugh- “Behold the many things I have no need of!” Hays suggests we take this a step further. The next time, you find yourself waiting at a Walgreens or CVS, or even Target or Walmart, feel free to roam the aisles as time allows, thanking God for all the things of which you have absolutely no need! 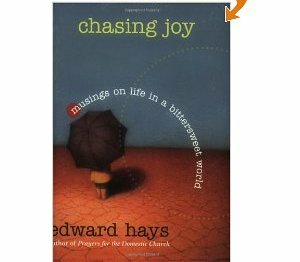 For Hays, joy is an addiction, or can be, insofar as it becomes a holy habit. But it's a practice that cuts against our prehistoric fear-based, survival instincts. Negative thinking does not come from our choosing it, but rather, negativity comes from our ancestors. So the complainers and grumps we know within us and outside of us haven't received the evolutionary tweak that joy's practice can bring, mentally and spiritually. So the sense of chasing joy, or pursuing happiness becomes a regular and disciplined choice for knowing and receiving the joy that no one and no situation can take away. This is a joy that 's there for taking, God's overflowing super-abundant love and grace, welling up to life here, now, forever.